OSWEGO, NY – The H. Lee White Marine Museum and Maritime Center invites residents and visitors alike to join us as we kick off the 2013 summer season the weekend of May 18 and 19 from 1-5 p.m.
As part of the celebration, the Maritime Center, which includes the main exhibit building, the National Historic Landmark World War II Tugboat “LT-5,” and NYS Derrick Boat No 8 will be open free of charge both days. 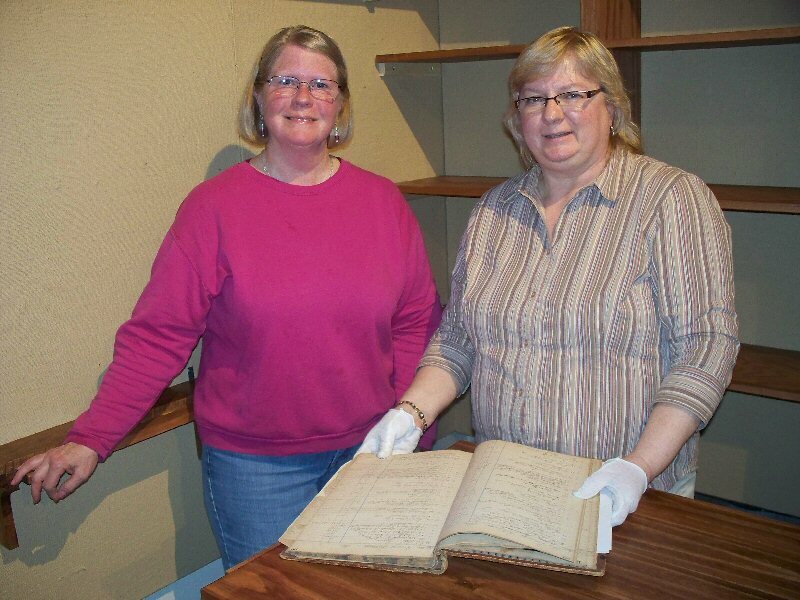 Mercedes Niess, right, executive director of the H. Lee White Marine Museum and Maritime Center and volunteer Anne-Marie Warren look over a chandlery ledger from the museum’s collection that will be part of the new “Ship Chandlery” exhibit opening during the Maritime Center’s season-opening weekend, May 18 and 19. The exhibit display will hold various artifacts and objects that would have been in this “nautical” store. Chandleries were the general stores for vessels. The display was built by volunteer Bob Finn. A lecture by historian Richard Palmer will discuss the topic of Oswego chandleries May 18. A new exhibit “Ship Chandleries” will also be premiered that weekend and a free history lecture on the topic will be presented by local historian Richard Palmer at 1:30 p.m. on May 18. “This weekend also marks both New York State Heritage Weekend and International Museum Day. It’s a perfect time to celebrate our history,” noted Mercedes Niess, executive dDirector of the H. Lee White Marine Museum. The museum’s main building features maritime and historical exhibits. New exhibit installations and renovations have been underway and bring history to today’s visitor through colorful vibrant hues and contemporary themes. Volunteers, staff and the director have been working all winter to transform several spaces. Among the museum’s vessels, which will be opening this weekend, most prominent is the World War II National Historic Landmark Tug the “LT-5,” which served during the Normandy Invasion. A dedicated crew of volunteers has carefully restored the LT-5. Also opening this weekend for touring is the 1925 New York State Derrick Boat 8, which worked the canal system for more than 60 years. On visual display is the Eleanor D, the last U.S. commercial fishing boat to work Lake Ontario. It was locally owned by the Cahill family and is undergoing preservation efforts. Also for viewing will be the Schooner OMF Ontario, back in port after winter storage. Finally, visitors and residents will enjoy the new apparel and gift items on display at the museum’s “Treasure Chest” gift shop, which is open for browsing during regular museum hours for free. An array of new jewelry with a maritime flare and books highlighting the War of 1812 are now available. The museum is located in Oswego’s “Historic Maritime District,” at the end of the West First Street Pier. Regular admission is $7 for adults and $3 for youth, age 5 and under are always free. Hours will be expanded to 10 a.m. – 5 p.m. during July and August. For more information visit, hleewhitemarinemuseum.com or facebook.com/hlwmm for upcoming events or call (315) 342-0480.